Getting a good pic from right in front of a spectacularly AWESOME panorama, a weird and wacky BIG Thing or a KILLER sunset is what’s called, in the technical photographic terminology used by us amateurs, a SURE THING. It’s SO easy, in fact, that worrying about my eventual exposure as a photographic fraud just makes me break out in capitals all over! So when the wonderful Linda of Journey Jottings tagged me to enter this year’s Capture the Colour competition sponsored by TravelSupermarket, my heart sank momentarily. Because not only am I a loud & proud photographic AMATEUR, the impact of my photos very much relies on the stories I tell about them. Just FIVE photos? In Red, Blue, Yellow, Green and White?? That STAND ALONE??? Yeah … I can do that! Kind of!! Let me show you my FIVE colours of OZ as captured in FIVE very different Australian towns!!! Towns I haven’t before shown you!! BUT … because I struggle with brevity AND I’ve got a snowball’s chance in hell of winning anyway, I’ve backed up each town with another photo to help show its true colours! These days, thanks to roads now mostly sealed in recent times, this little outpost on the edge of the remote South Australian Outback is less than a day’s drive – 685 km – from Adelaide. But that wasn’t always the case. Once the rail head for the Ghan railway, then an important link on the now defunct rail route to Alice Springs, but only accessible over a LOT of gravel, like in this photo, Marree was once considered WAY beyond the Back of Beyond! 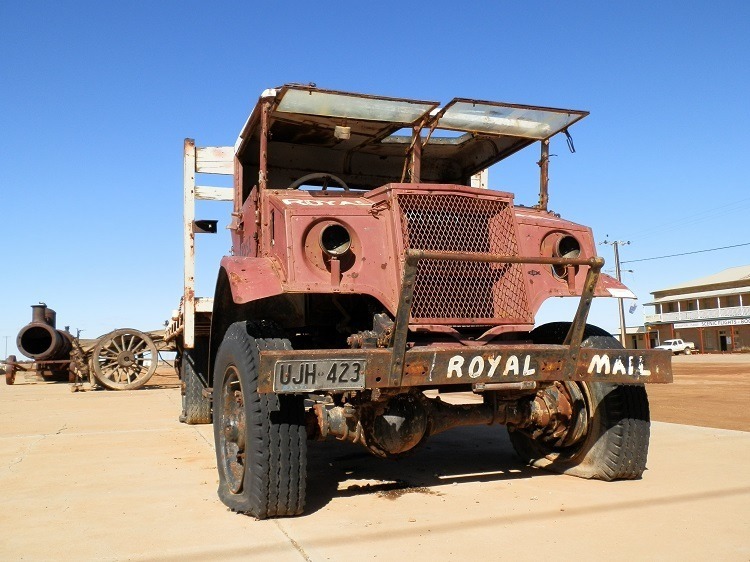 And that’s also the name of a documentary about Tom Kruse, legendary Outback mailman who for nearly 30 years battled extreme temperatures, dust storms, sand dunes, floods and breakdowns to deliver mail in this RED 1936 Leyland Badger mail truck along the 519 km of the notorious track from Birdsville to Marree. The truck now rests at the old rail yards across from the Marree Hotel – which ironically offers scenic plane and helicopter flights! And why not? 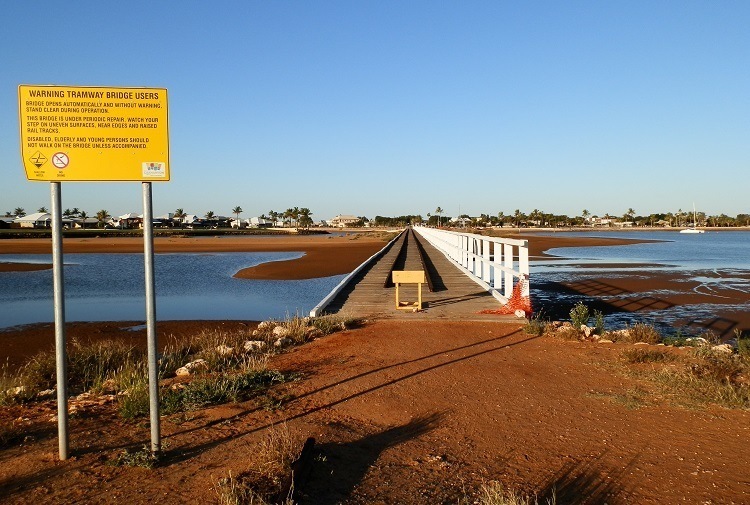 You wouldn’t want to miss Lake Eyre and Marree Man now, would you?! An ecstatically happy combination of beaches, river, cafés, historic buildings, markets, shops, restaurants and other good stuff, Brunswick Heads is often (unaccountably) bypassed in favour of its bigger and WAY more brash neighbour Byron Bay, just down the coast from the Queensland/New South Wales Border. And did I mention the bakery? A vibrant community set amidst some of the most beautiful scenery in the Northern Rivers region of New South Wales, whether you’re a surfie, fisherperson, yuppie, grey nomad, tourist, trendy, backpacker, retiree or hippy there’s always something interesting to do at Brunswick Heads! And I’m not just talking about the bakery … although that’s SO fine, it’s worthy of visiting in its own right!! Surrounded by the sea (see 1st photo above), the Brunswick river, and the hinterland behind, it’s hard to imagine Brunswick Heads featuring any colour but BLUE! Actually, small town Windorah, a great base from which to explore the Barcoo shire, is better known for its RED! SO red they hurt the eyes (see above), the incredibly photogenic local sand dunes just west of the township within cooee of the well known Coopers Creek are a tourist attraction in their own right. BUT despite that – or maybe because of it – I couldn’t help noticing this YELLOW Backhoe (? can anyone enlighten me??) just off the highway in a Windorah backyard. And while yellow is an aberration in this Outback Queensland town dominated by the strong reds, greens and blues that typify the region in a good year, it’s a story in the making! I wonder what the toy-owner will become when she or he grows up?! 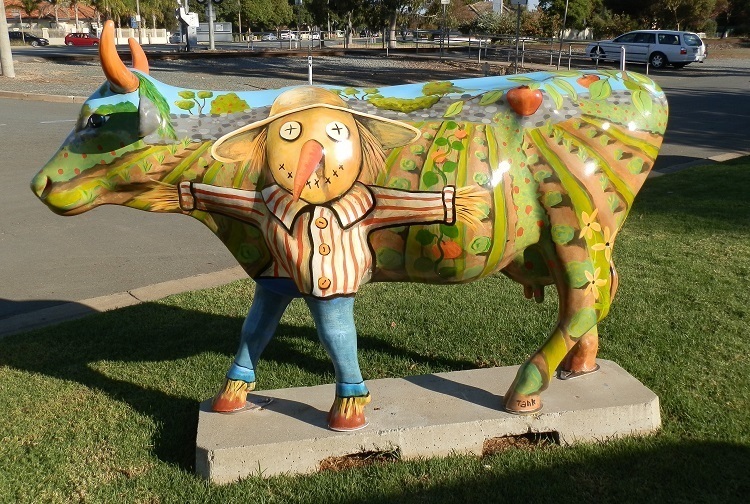 Nothing says ‘Shepparton’ or ‘Goulburn Valley Food Bowl’ better than an individually decorated life-size fibreglass cow – part of the MOOOOVING Art project – right?? For several generations of Aussies raised on Goulburn Valley products, the large regional town of Shepparton is worth a visit. And not just for the factory outlets such as Campbells and SPC Ardmona either! Check out its natural attractions, wineries and walking trails, restaurants and – yes – bakeries, including the award winning slices of Tatura! But for my money, a morning walk around Lake Victoria is hard to beat – and it’s also GREEN! They’re MY true colours! But there’s PLENTY more colour in Australia’s colourful country towns! 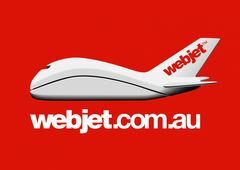 Check out my other TOP Aussie Towns HERE! Or better still – visit some and see what I mean for yourself!! Wow! These pictures are gorgeous… I had just read about Short Breaks – The Shires when I came upon your blog. Lovely, lovely images… Thank you! Wow! These pictures are really gorgeous… I had just read about Short Breaks – The Shires when I came upon your blog… Lovely, lovely images… Thank you! you have done well representing the colours of Australia RED – and I wouldn’t say you were an amateur at all – you have to know what you are doing to capture great pics. Happy travels. Wheee! I really liked that red truck–it looks like something my grandfather would have driven. But I’m afraid that the button eyes of that scarecrow in the green picture are following me…. Thanks so much for nominating me – I had fun doing the challenge!! 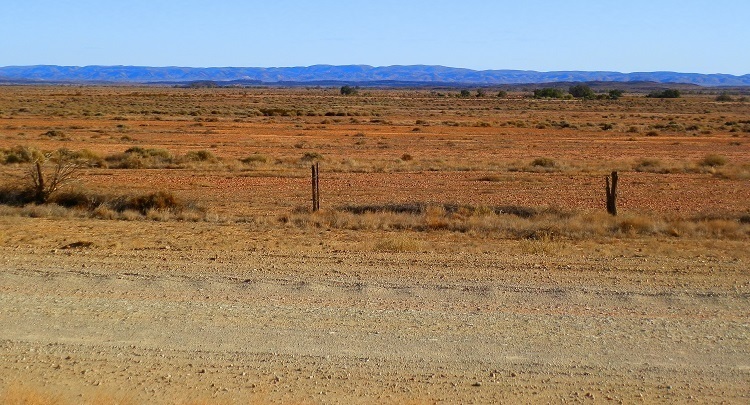 I love the Marree landscape photo as I love the colours of the earth in the outback. You make me want to go and visit all these places (I might have actually been to some of them, but never can quite remember them as much as I should!!). Magnifiques photos! superbes paysages et aventures! Très joli post! je découvre ton blog que je trouve très intéressant, je reviendrai bien sûr, je me suis inscrite pour le suivre et je t’invite à venir me voir sur les miens à l’occasion, n’hésite pas, j’aurai le plaisir de te lire! Merci encore! Red, you are one of the best advocates for Australia I have ever come across! 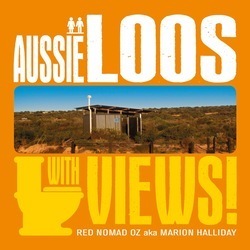 Your stunning photos and brilliant, friendly “banter” is appealing to tourists and Aussies alike! 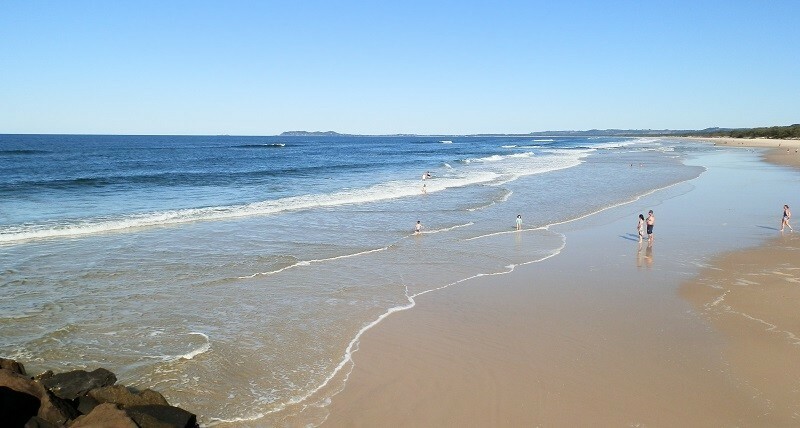 I really want to visit Brunswick Heads now. And, oh for a chocolate covered frozen banana in Carnarvon! Bliss – and summer is coming. While I enjoyed your five ‘official’ entries very much, I enjoyed the supplementary photos and ‘stories’ even more. Love your color theme and your nomination of other bloggers to post their photos. You always manage to expand my horizons. That truck just cries out for a restoration, it is great looking. The red sand photo was funny as well as being visually striking. Thank you for your visit and comments on my blog. Am I happy to say: I was in Marree 🙂 And “rode” the Birdsville track, oh it can be chaos over there! So sad I can´t visit Tom Kruse Gallery! And you know something? Since I moved to Braunschweig blue stuff haunts me! May it be a carpet, a car, the last pair of shoes… blue it is when I cannot choose! Quite honestly I think it´s also a bit sad those gravel roads get bitumened (is that a word, bitumened?). I loved the gravel roads, I loved the grids, I loved all those cows roaming free (yes, I was a traveller for fun, I know!). Windorah 🙂 Sweet memories! 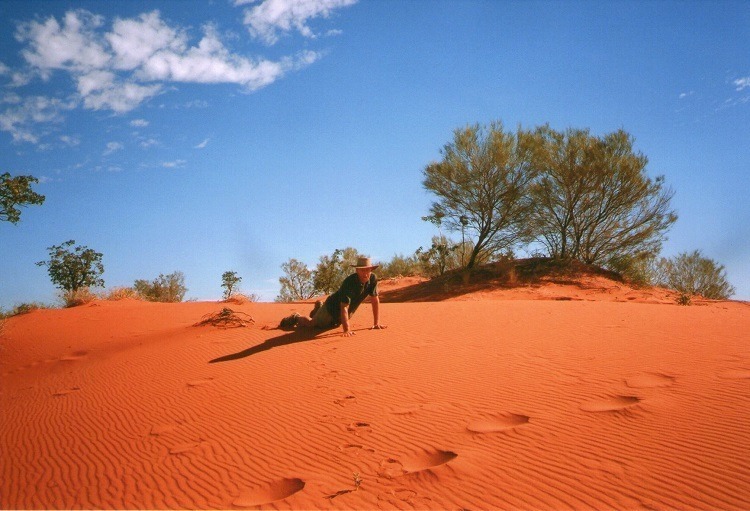 Carnarvon, the big dish, ohhhh… I´m “homesick” now! All in all we spent I guess at least 8 weeks in Carnarvon. Luckily Ingo never – but once – caught an ediable fish on the old prawn jetty, so Chicken Treat was my best friend, food wise! And… we have nothing like Chicken Treat over here! No Hawaiian Pack in 7 years!!! Am off to check out the other blogs 🙂 Yay for traveling! Awesome Red, and I’m so glad you suffer from a lack of brevity 🙂 Although I loved your photos (and I have fallen in love with Brunswick Heads – I think I’d like to go and live there from your summary of it) your stories around the photos were the magical bit for me 🙂 Glad you took the time to take up the challenge. My fave pic was the laughing dove, and reminded me of our time in Africa. I love the white entry! So subtle. Great stuff. Great choices for your photo hunt. The shot of the guy in the red sand is awesome. I love the cow and the dove. Great post, Red! Have a happy week ahead! Great photo’s have you made…it’s a interesing post. Have you seen already my other second blog…you are welcome. I liked the green entry very much. Nicely themed shots. Really great entries Red, I particularly like that cleverly painted cow in Shepparton. I’ve been there, but it was a quick shopping trip and I really don’t remember it. I hope you rescued that poor guy in the Red sand. Lovely collection of photos and their colours. 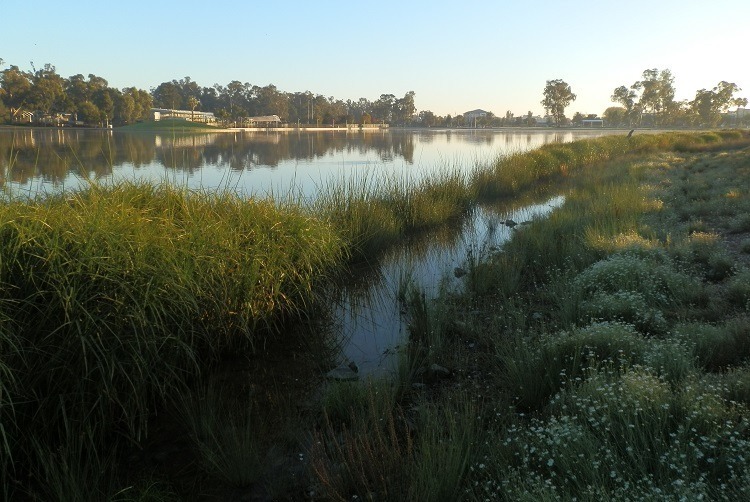 Shepparton’s Lake Victoria, great to see it has water in it once again….was not long ago and all the water was but gone, the revamp is good or the swamp. Love the cow, never did see that! Good luck with your competition. 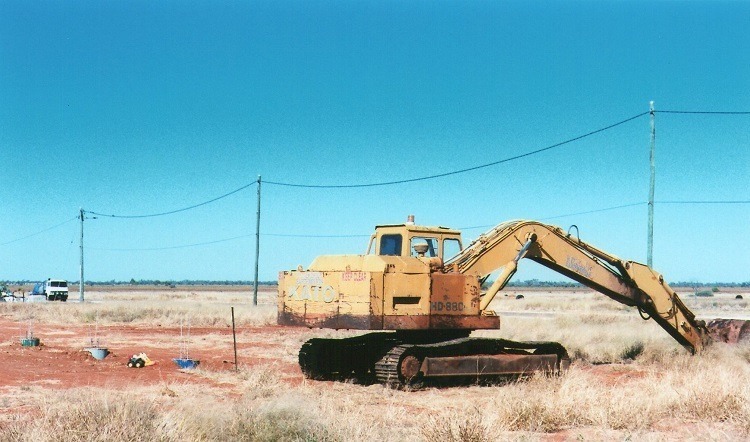 The Marree Man is an interesting mystery I never heard about when I was in the area, and I love the little yellow bulldozer! Back of Beyond is an interesting documentary to watch after seeing the landscape around Marree from the airconditioned comfort of a car. It might well be a story from another planet. Oh no. Not those damn Shepparton cows again. Not your fault. Great photos. Not sure whether a Mooooing piece of art is more in keeping?